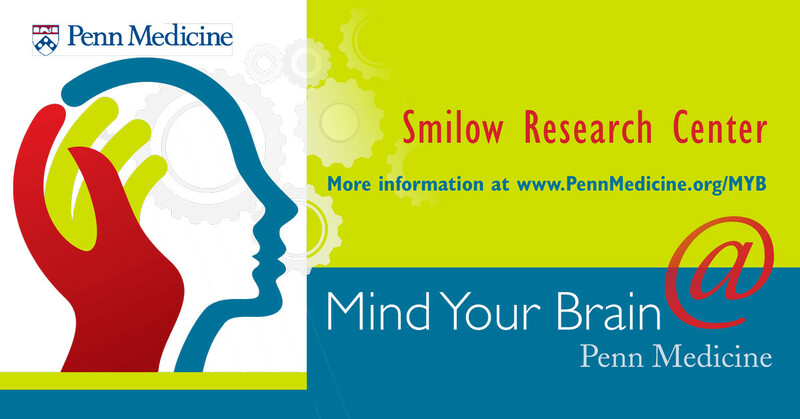 The mission of the Mind your Brain @ Penn Medicine conference is to enhance, through education, advocacy, support, and research, the quality of life for those affected by brain injury, including patients, survivors, families and caregivers. All affected by brain injury should, and can, have immediate and equal access to services and support to help lead full and meaningful lives. 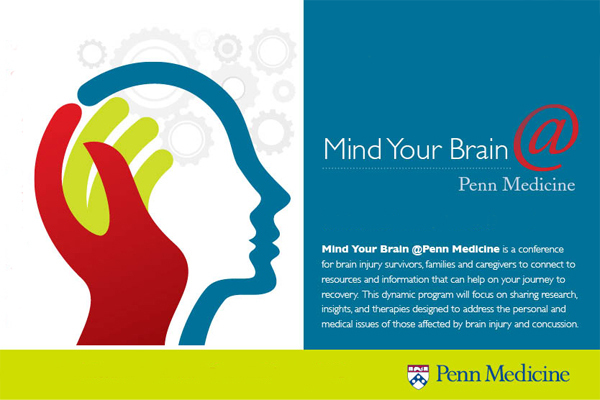 In March, 2019, during Brain Injury Awareness Month, Penn Medicine will be hosting Mind Your Brain @ Penn Medicine, a conference for brain injury survivors, families, caregivers, and interested parties to connect to resources and information that can help on the journey to recovery. This dynamic program will include presentations, interactive discussions and resource sharing by a variety of authorities. This includes Penn Medicine’s experts on neuroscience and brain injury, former professional athletes, physical, occupational, and speech therapists, and brain injury survivors. This program will focus on sharing research, insights, and therapies designed to address the personal and medical issues of those impacted by brain injury. 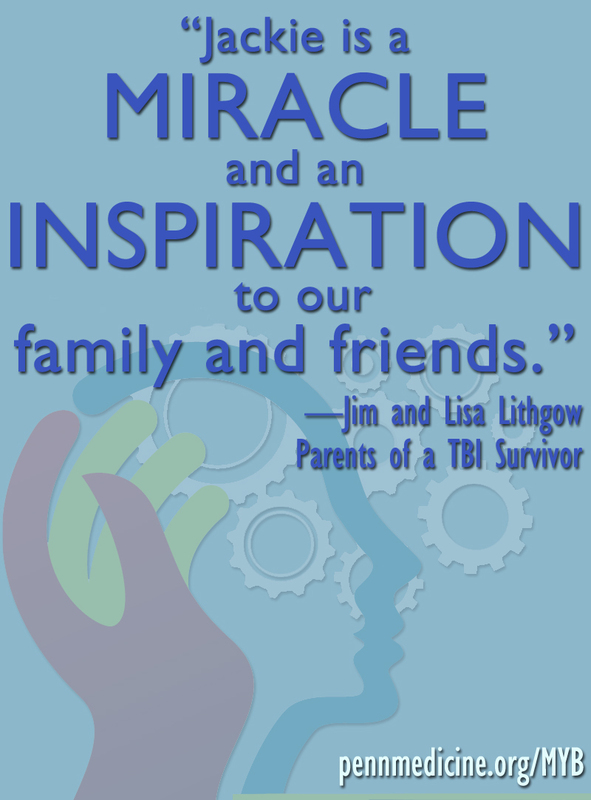 LoveYourBrain offers a range of free meditations designed exclusively for the TBI community. Amy Kraft — Over the past year I've learned that TBI is an invisible disease and research into the condition and its treatment is lagging for women like myself. I'm currently working on a book about the science of traumatic brain injury in women to help raise awareness of this growing problem. I look forward to the Mind Your Brain conference to get to know fellow patients of brain injury and meet with experts in the field. Thank you for letting me participate in such an important event and please let me know if there is any way I can help out. Mary Beth Morgan — At the age of 12, I was hit by a drunk driver. So much work went into my recovery and I had to learn everything again (walk/talk/breath/write/every day functions). With the help of my doctors, nurse, therapist, and social worker at CHOP, I have come a long way. I use the resources that I was taught to use continuously, and I share the transition skills with youth and young adults with all types of disabilities. 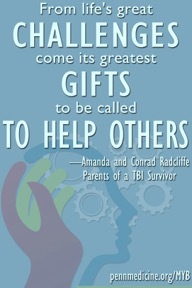 I honor everyone because we are unique in the way that brain injury affects us and we are all champions of the mind! Norman Salvat — I am a TBI survivor who suffered a subdural hematoma as a result of a football injury in 1945, when I played on the Central High School varsity football team. I will be 90 years old this October and have lived a very active, I think productive life. I still drive, play 18 houles of golf several times a week and sometimes I play tennis. I hope to be able to attend MYB 2019! On July 19, 2005, Candace Gantt suffered a serious brain injury after being struck by a car while riding her bicycle. Following an extensive hospitalization and surgeries at Penn Medicine, she was back on her bike just six months after the accident. For years Trisha Meili was known to the world as The Central Park Jogger. Her amazing story of survival and recovery was detailed in her best-selling memoir I Am The Central Park Jogger:A Story of Hope and Possibility. Trisha’s story is not of an attack, but rather, one of healing. The horror of her attack brought an outpouring of support and love from her family, friends, healthcare workers, co-workers, and strangers. Today Trisha is one of the most sought out inspirational speakers on the lecture circuit. Audiences enjoy Trisha’s energy, wit, and poignant stories about the power of the human spirit. Through her work, book, and lectures, she reaches out to people struggling through recovery from any number of problems, offering Hope and Possibility®. Antoinette Radcliffe was an exceptional student, passionate leader, and compassionate high school student. While on a Global Leadership Institute trip to Costa Rica in July, she suffered a TBI while playing soccer. A severe concussion led to seizures and she missed most of her senior year, deeply suffering with the agonizing symptoms of TBI. She managed to graduate and matriculate, but not with the joy that she, or we, had expected. It's been a long hard road of recovery, advocacy, and determination. Our daughter has worked tirelessly, overcome so many obstacles, and is now a junior at Penn, with a unique and remarkable empathy and compassion for her pursuit of a career in pediatric neurology. In addition to her studies, she makes time to be a campus EMT, leads Penn Speaks for Autism, and volunteers at CHOP. Her calling to this area of medicine was born of her deep love for her special needs brother, but her own experience, and her long and very brave recovery, will inspire her to be all the more a truly wonderful, compassionate and empathetic physician. We’re so crazy proud of her. 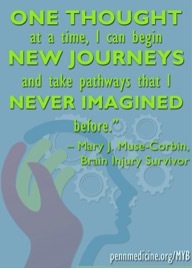 In a near fatal car accident in 2006, Mary J. Muse-Corbin incurred a traumatic brain injury. She has since immersed herself in culinary arts to assist her recovery. View some of the exciting 2016 MYB conference sessions here.